AZCentral.com – Chicago Hamburger Co. 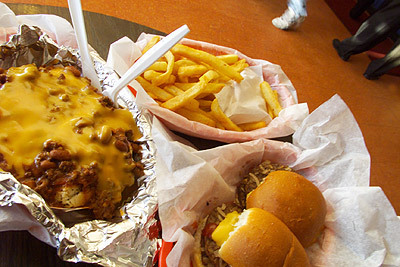 Comments Off on AZCentral.com – Chicago Hamburger Co.
Chili-cheese dog, french fries and sliders at Chicago Hamburger Co.
For many people, sports and Chicago are synonymous. Bob Pappanduros is one of those folks. So much so that he recreated a slice of Chicago culture in Phoenix when he opened his burger joint, the Chicago Hamburger Co., in 1981. This friendly restaurant feels more like a hangout, a place where you can settle in, catch a game on TV and eat good food. With Chicago memorabilia plastered about the place, it’s easy to forget the sun outside and to invoke some of the Chicago’s notorious wind in your mind while breathing in an aroma that encourages a stomach grumble. Ordering is fast-food style, and there’s plenty to do while you wait. Checking out the TV is an option, as is playing Ms. Pac-Man or getting in a game of pinball. Chicago-style eateries like this are made up of three key components: burgers, namely sliders; hot dogs and sausages; and Italian beef. Chicago Hamburger Co. has all of them. Sliders are a brilliant invention, or maybe not. It all depends on how many you let slide past your lips. They are, for those who don’t know, thin hamburger patties on small rolls – think dinner-roll sized. Chicago Hamburger Co.’s Original Windy City Sliders (99 cents with cheese) come with mustard, ketchup, pickles and onions and are superb on the restaurant’s soft, fresh rolls. They make it easy to lose count. Hot dogs are one of life’s guilty pleasures. I’ve seen people profess disdain for the dogs only to go to a baseball game and trip over small children to get to the vendor. Using the Vienna Beef brand and steaming them for optimum flavor, the Hamburger Co.’s chili version ($4.35) comes with fries or creamy coleslaw and are just how you want them to be: messy with a covering of flavorful chili and a scattering of chopped onions. The provolone beef sandwich ($5.85) was the agreed favorite. It was piled thick with thinly shaved roast beef and topped with melted provolone and a serving of combined hot and sweet peppers. The sandwich was served with an au jus sauce that made it a contender with the chili dog as the messiest item. But with good eats like these, it’s worth the extra napkins. Another notable menu item is the Frito pie ($2.60). I hadn’t seen this dish since a sixth-grade slumber party. The layered pie made of Fritos, chili, cheese and onions was just as I remembered it: gooey and good. It may not be something for daily consumption, but it was a nice reminder of the casserole side of life. It would have been even more perfect had I thought to ask for a dollop of sour cream. Chicago Hamburger Co. also has options to accommodate health-conscious eaters and vegetarians. The garden salad ($2.60) comes with lots of vegetables, and the triple-cheese sub ($3.65) is a minus-the-meat delight. Veggie burgers also are offered. Also tasty are the wings ($5.25), which come by the dozen. The restaurant offers mild, medium, hot or nuclear, in addition to the barbecue and teriyaki flavors we tried. We weren’t disappointed. The menu is loaded with a variety of regular burgers, chicken sandwiches, Philly and turkey cheesesteaks, polish sausage and more. Sides include fries, onion rings and fried zucchini. To satisfy your sweet tooth, the restaurant offers homemade milkshakes at $2.95 for a small and $3.95 for a large. For a delicious twist, add banana for 50 cents. The milkshakes are a reason to stop by the restaurant even if you’re not having a meal. Also available is a root beer float ($2.50), a perfect combination of thick vanilla ice cream and root beer. Even if you don’t dig Chicago or sports, this is still a great little neighborhood place for a quick meal to go or a family outing.